A great exhibition, and tribute to Sigmar Polke (1941 - 2010), is now on show at the Akademie der Künste in Berlin, curated by the President of the Akademie der Künste, Klaus Staeck. 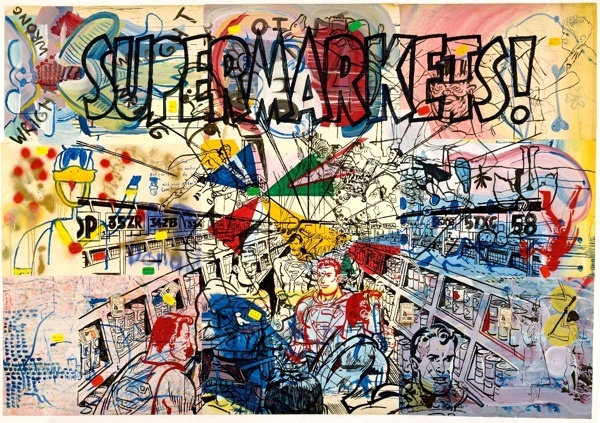 The exhibition is entitled, Sigmar Polke - Eine Hommage, Bilanz einer Künstlerfreundschaft Polke/Staeck (Sigmar Polke - a tribute, a balance of artistic friendship Polke / Staeck) and will run until the 13th March 2011. The exhibition explores Staeck's forty-year long, working relationship and friendship with Polke, and further exposes why Polke is one of Germany's most important artists. Polke attended the Kunstakademie Düsseldorf (Arts Academy) at the age of twenty, where he was deeply influenced by one of his teachers; legendary artist, Joseph Beuys. As well as having a strong grounding for artistic creation at school, Polke was also beginning his life as an artist at a time when Germany was going through huge cultural, social and economic change. Düsseldorf in particular, in the 1960's, was a vibrant commercial city with a strong artistic community. In 1963, along with Gerhard Richter and Konrad Fischer (Konrad Leug as he was also known), Polke founded the painting movement, Capital Realism. The movement championed the pictorial short hand found in advertising, with subject matter often commenting on the consumer driven capitalist mode adopted by western civilisation. The exhibition at the Akademie der Künste has around 90 large scale works on show, covering the four-deacades that Polke and Staeck were friends. Alongside the works there are also testimonials and photographs documenting Polke's artistic life, with Staeck opening up his personal archives to add a rare touch to the exhibition. For more information on visiting the show, visit the Akademie der Künste website.